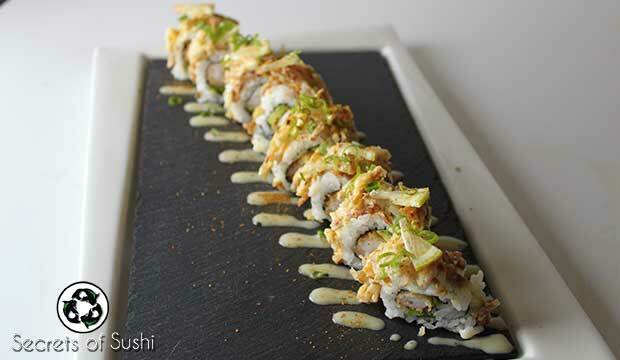 The Heaven Roll is a fitting name for this sushi recipe! The savory flavors of tempura fried, coconut shrimp are complimented by fresh lemon zest and crisp asparagus. This recipe was the whole reason why I set out to learn how to make Garlic Mayo – and I promise you that after you try it you will see why. This recipe makes 5 Heaven Rolls. As a disclaimer, this is a very long tutorial. 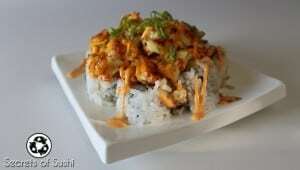 But I promise you that the amount of effort that goes into making this roll IS worth it! 1. 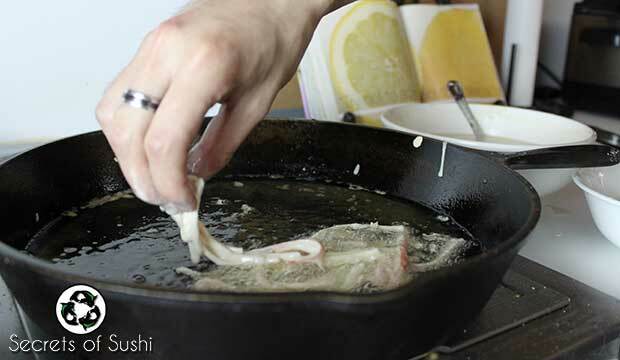 Fill your cast iron skillet with approximately 1cm of fryer oil put it on a medium heat. 3. 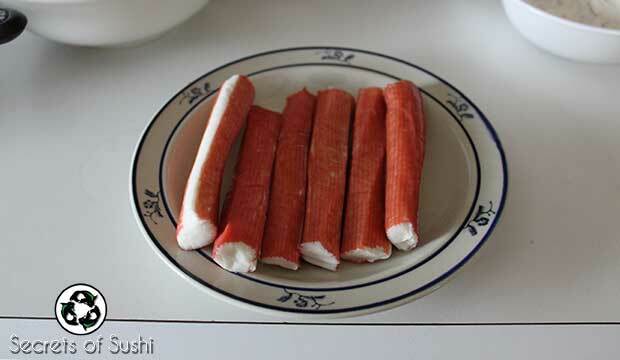 Unwrap your crab sticks and place them on a plate. 5. Holding on to one end, gently slap the crab stick against your other palm. 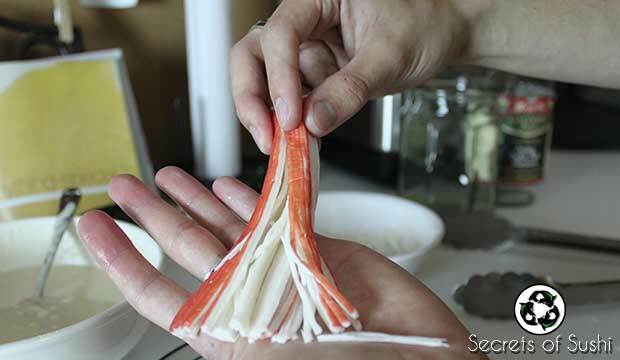 This will allow the crab stick “strings” to separate more easily. 7. 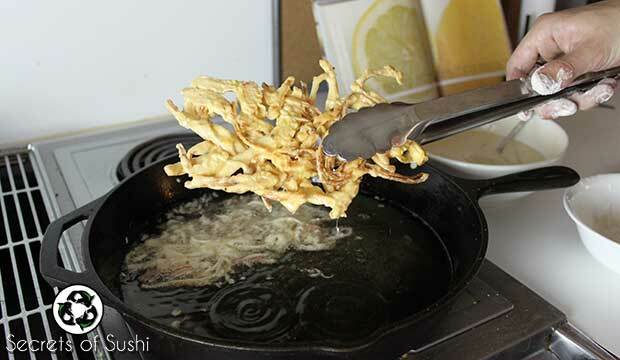 Then, dip them into the tempura batter and make sure that any excess batter is allowed to drip off. 8. 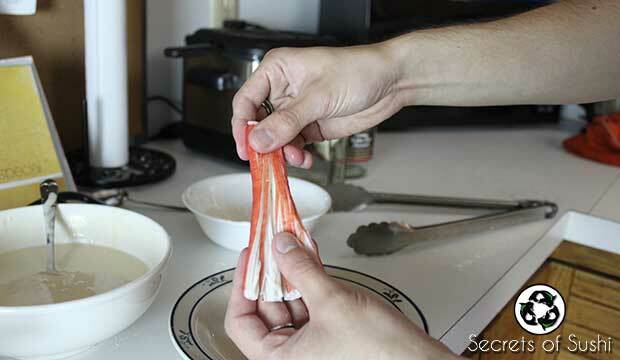 Gently dip the crab strings into the hot oil, making sure to place them loosely. The goal here is to try to make a web of these strings that is large enough to cover a sushi roll. I usually try to make mine 4″ x 8″ (10cm x 20cm). 9. 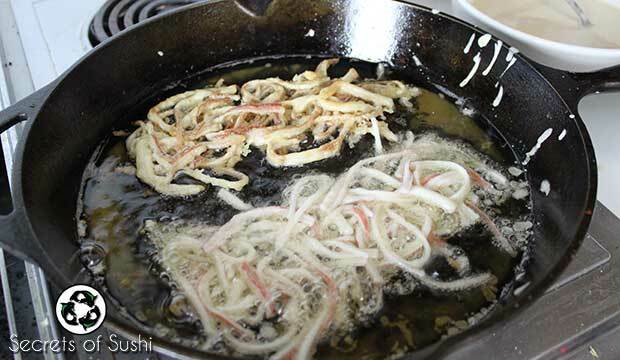 Repeat steps 4-8 until you have fried all of them. 11. 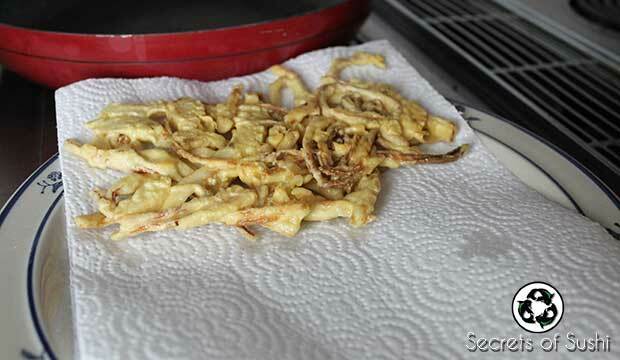 Set the fried crab strings onto a paper towel to allow for the grease to drain. 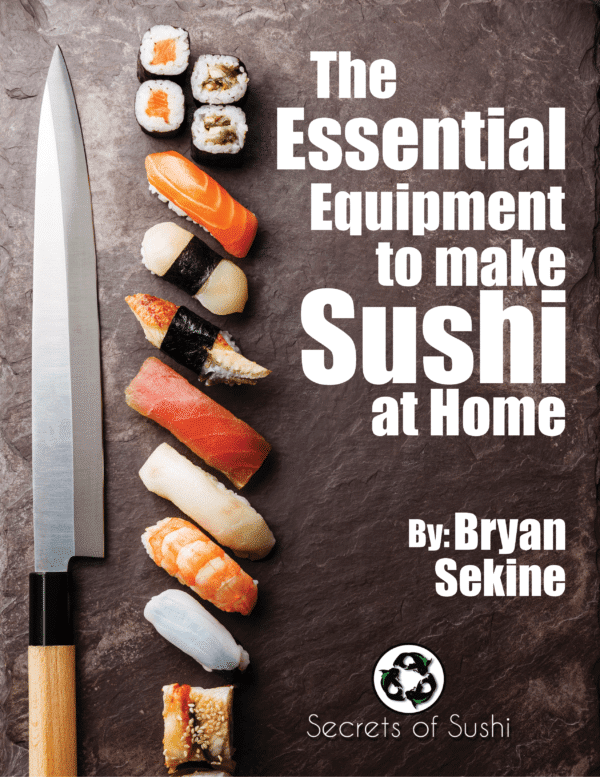 At this point, you want to go ahead and start cooking your sushi rice, if you haven’t already. 1. Soak your bamboo skewers in water for at least 5 minutes. 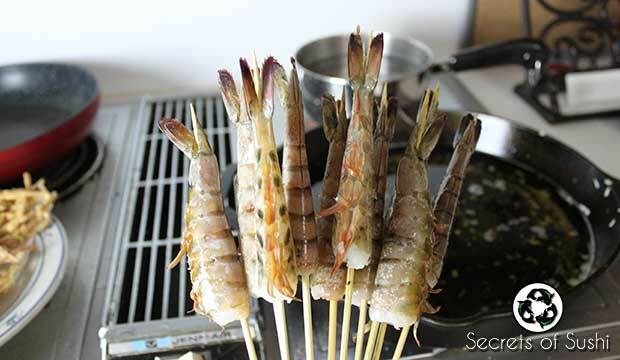 After the skewers have soaked, you can skewer the shrimp from head to tail. 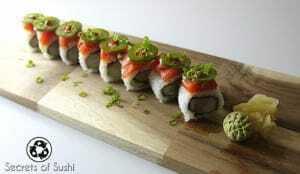 For detailed instructions on how to do this, check out my recent post on the Great White Roll. 2. Bring a pot of water to a boil and boil the shrimp for roughly 60 seconds. 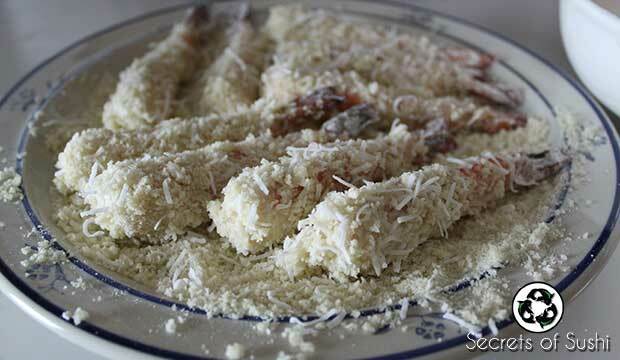 We want to make sure that we don’t over cook the shrimp, because they will be deep fried as well! 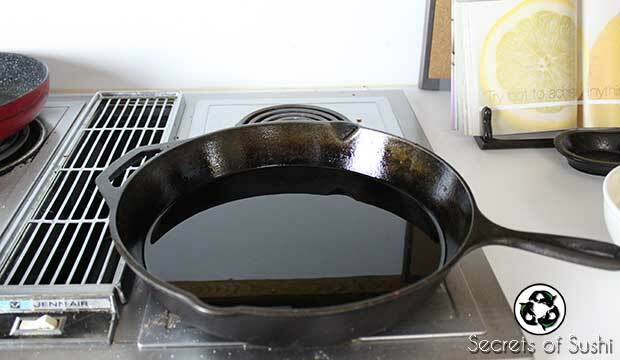 We also want to add additional oil to our skillet. Now the oil level should be approximately 3 cm deep. 3. After boiling, remove the skewers and shells (I leave the tails on by habit, but you can remove the tails for this recipe). 4. 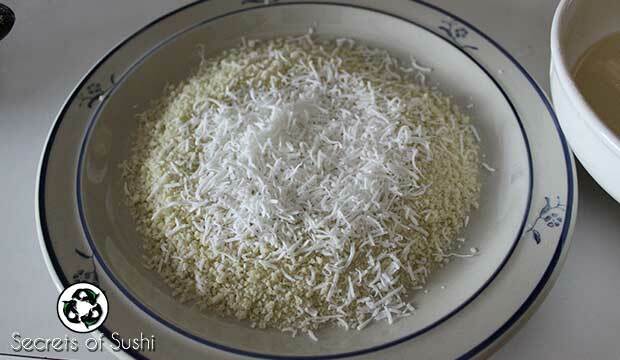 Pour approximately 2 cups (256 grams) of panko and 1/2 cup (64 grams) of coconut flakes onto a plate. 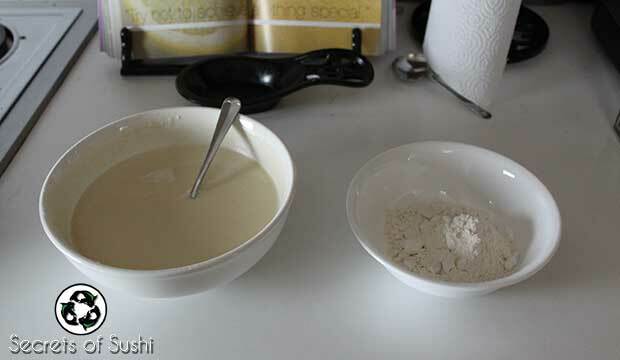 Mix until the coconut flakes are evenly distributed. 7. 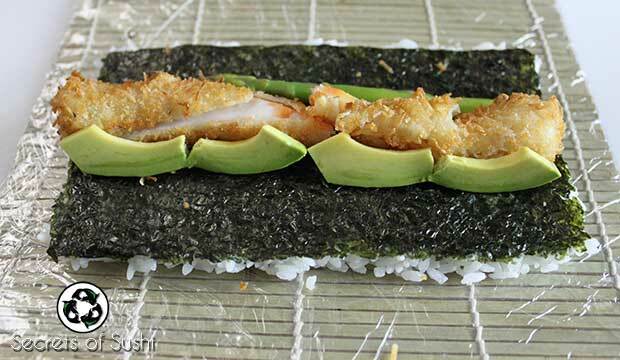 …then roll it around the coconut panko until it’s completely covered! Repeat steps 5-7 until each shrimp has been coated. 8. Now we are ready to fry. 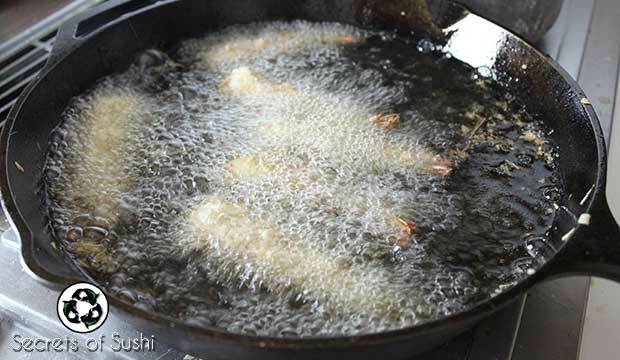 Carefully place each shrimp into the hot oil and fry for about 1 minute and 30 seconds, or until golden brown. 9. 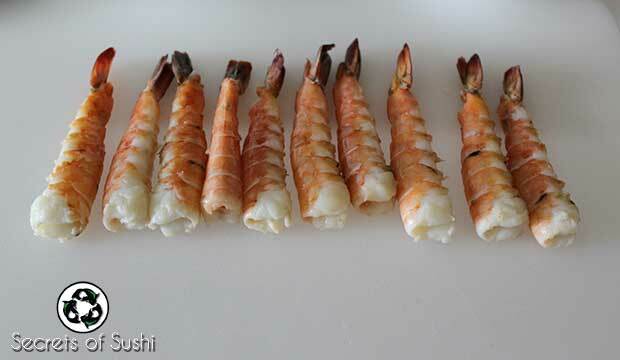 Remove the shrimp using a pair of tongs and allow them to cool off on a plate with a paper towel underneath them. Time to Make the Heaven Roll! Make sure to blanch your asparagus and slice your avocado. 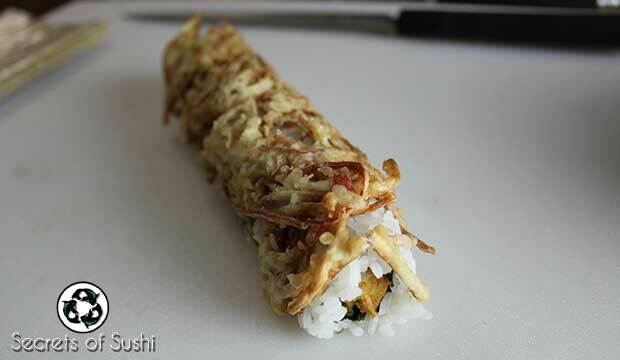 For instructions on how to do both, please see my tutorial on the Futomaki. Whew! Okay… now we are ready to roll. 2. 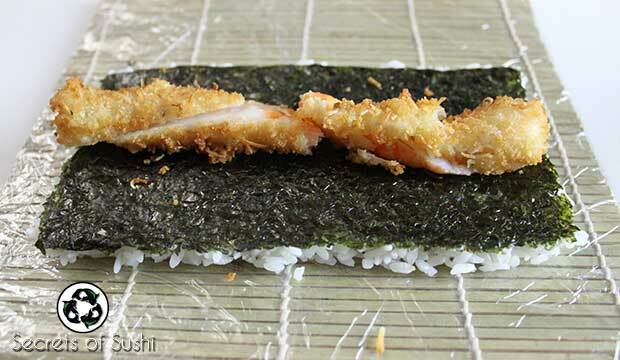 Flip the rice mat over and add two coconut shrimp to the center. My shrimp weren’t quite long enough to reach the edges of the nori, so I sliced them diagonally and slide them apart just a bit. 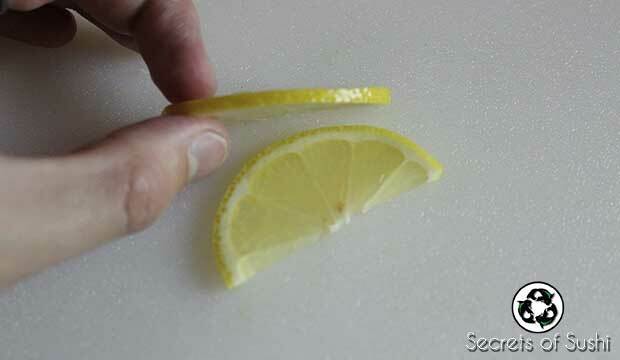 This is a neat trick that you can use on just about any ingredient that doesn’t reach the edges. 3. Add a piece of asparagus and a few pieces of avocado. 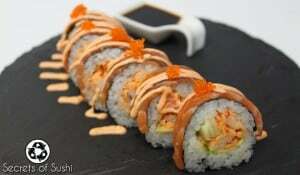 Remember, we are trying to get a consistent amount of each ingredient in each bite of sushi. Don’t be afraid to play around with the ingredients to make sure that they are consistent. 4. 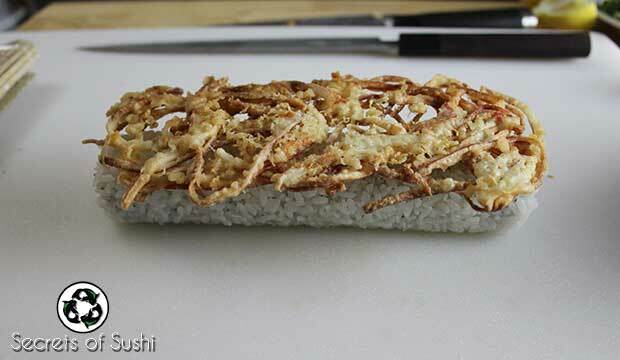 Now, roll up your maki (roll) and place one piece of the crab strings on top of the roll. 5. 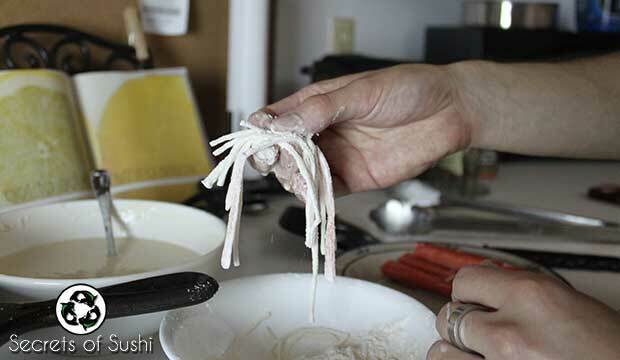 Placing your makisu on top of the crab strings, firmly press down and form the crab strings around the roll. Don’t worry about breaking the crab strings. 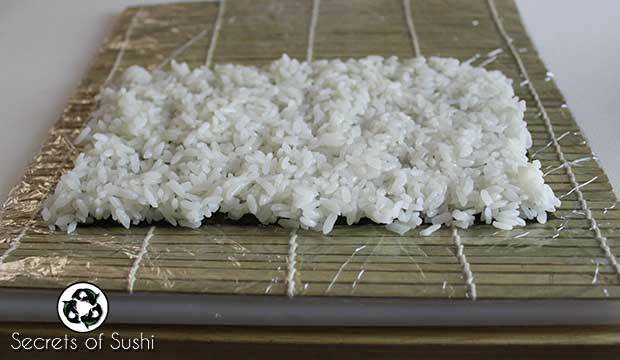 This step should press the crab stings into the rice and generally keep them conformed to the roll. 6. Now it’s time to cut our roll into 8 even pieces and place it onto a plate. 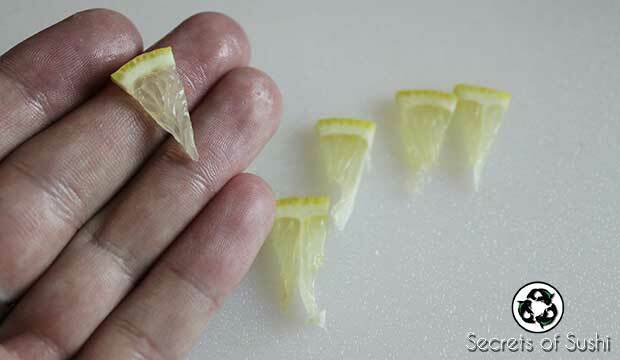 I usually try to make my slices about 5-8 mm thick. 8. 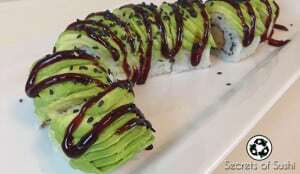 Slice each of those slices into pie wedges and place one wedge on each piece of the Heaven Roll. 9. 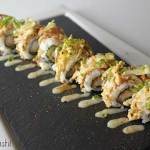 Drizzle some garlic mayo, sprinkle some finely chopped green onions, add a dash of Shichimi Togarashi, and you’re done! Now it’s time to enjoy the fruits of your labor! Let me know what you think about this recipe in the comments section below.